Even though Amazon Prime Air isn’t yet ready for lift-off Will Amazon Drones Really Be Arriving at a Backyard Near You? Will Amazon Drones Really Be Arriving at a Backyard Near You? Amazon thinks they've cracked the delivery code. By using unmanned, automated drones, they'll be able to get packages into the hands of buyers in 30 minutes or less. Read More , Amazon is exploring other ways of getting those important packages to you. Its latest innovation is Amazon Key, a new service which means you can let strangers into your house even you’re not there. Which isn’t as scary as it sounds. 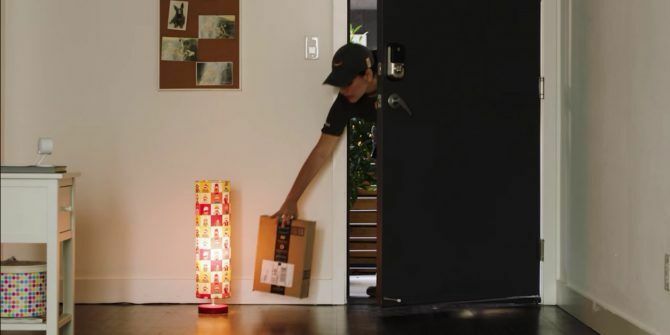 Amazon is pushing hard to worm its way into your home. Millions of people already own Echo devices, with Alexa always listening out for her name. And now, Amazon is pushing even harder. The fact that Amazon Key also makes it easier for Amazon to deliver parcels is merely a bonus. Amazon Key lets you keep control of who enters your home from afar. It uses a combination of a security camera and smart lock to enable couriers, services, and guests to enter your home without you actually needing to be there. With Amazon taking care of the backend stuff, of course. For $249.99, Amazon will supply and install the Amazon Key In-Home Kit. This comprises of the Amazon Cloud Cam and a compatible smart lock by Yale or Kwikset. The smart lock controls who can open your door, while the Amazon Cloud Cam records everything that happens when anyone enters. Once installed, the courier at your door will scan a barcode on the package. Amazon will then verify this is the right package at the right address, and grant them access to your home. At this point the Amazon Cloud Cam kicks in, recording everything to ensure there’s no funny business. Amazon Key isn’t just for couriers though. Which is a good thing given the asking price. Instead, Amazon Key offers keyless access for your family and friends, with you able to “set the frequency and length of time a person has access” and “add or remove contacts” using the Amazon Key app. Amazon Key is only available to Amazon Prime members in 37 cities across the United States. However, Amazon is promising to add more locations in the future. You can pre-order Amazon Key from today, but you’ll have to wait until November 8 for the app and service to come online. Amazon Key is a double-whammy for Amazon. For starters it makes it much easier for Amazon to deliver your parcels. But it also enables Amazon to install another smart device in your home in the form of Amazon Cloud Cam. Which will be a bigger deal in future when smart homes are standard If These 4 Things Happen, Every Home Will Be a Smart Home If These 4 Things Happen, Every Home Will Be a Smart Home In just a few years, smart homes have entered the mainstream consciousness. For the first time in ages, smart homes have a real, mass-market promise. But there's still a long way to go. Read More . What do you think of Amazon Key? Would you ever feel comfortable letting couriers into your home when you’re not there? Do you think Amazon Prime Air will ever take off? Do you have any interest in installing smart devices in your home? The comments are open below! Explore more about: Amazon, Amazon Prime, Smart Locks. YouTube Music Is Now Free on Google Home SpeakersWhich NFC Payment App Offers You the Most Security? "Would you ever feel comfortable letting couriers into your home when you’re not there?" Definitely not. Unless they are bonded AND the company is completely responsible for their actions. "Do you think Amazon Prime Air will ever take off?" Probably. There always are the people who will try anything just to be thought of as being on the bleeding edge. "Do you have any interest in installing smart devices in your home?" X10, yes. Anything with WiFi capability, definitely not. WiFi security is just not strong enough.